Remember! Subscribers to Torn World get 10% off all our publications! 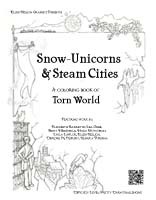 Torn World's first coloring book is an awesome introduction to the visual delight of this unique shared world. Now available as an e-book or paperback, this illustrated collection of short stories gives a marvelous taste of the family and community structure of Torn World, as well as a glimpse at some of the unique world details.